My confession about Halloween follows a pretty strict separation from it because my upbringing wasn't so keen on its pagan origins. The more American deviation being about entertaining scares and kid-friendly fun just wasn't excuse enough to handout candy or feel comfortable getting dressed up. By the time I became an adult, the damage was already done. But I loved horror movies, so Halloween would always have me in its grasp in some form. I celebrated by marathon-ing Halloween-themed movies and the franchise and eating candy in front of my television instead of being a Cheerio from Glee and knocking on strangers doors/attending a party. I listened to the Halloween score while I took long strolls to the store, auburn tree lines, golden blowing leaves, and the cool air complementing my much better Fall wardrobe. I had to sneak my own, private celebration. As an adult, I still trying to find my groove. Wanting to just hand out candy is a big step. Finding a costume and a good makeup artist, a bigger one. It feels very much like that Halloween episode of Dead Like Me where the reapers were actually seen to the living as their once living selves. It is a fitting allegory for horror fandom. Most people "kinda get it" around Halloween time because the season serves as a reminder of why the scary stuff is as old as humankind, and why the stories do matter. I was thinking of writing a little excerpt on my search for scary SFX makeup using dark skin (Black and Brown) models to replicate an idea for Halloween. I am not very verse in SFX application or makeup, so the tutorials would have been a great help. Up until now, besides the help you and the other ladies gave me, I have yet to find any tutorials. I have been a lover of horror since the age of 4, my first movies being Night of the Living Dead (1968), Fright Night, Child's Play, and Nightmare on Elm Street. We lived next to a cemetery and the kids in the area, myself included, used to play in it all the time. Well to the point, I decided to make my own scary makeup this Halloween. 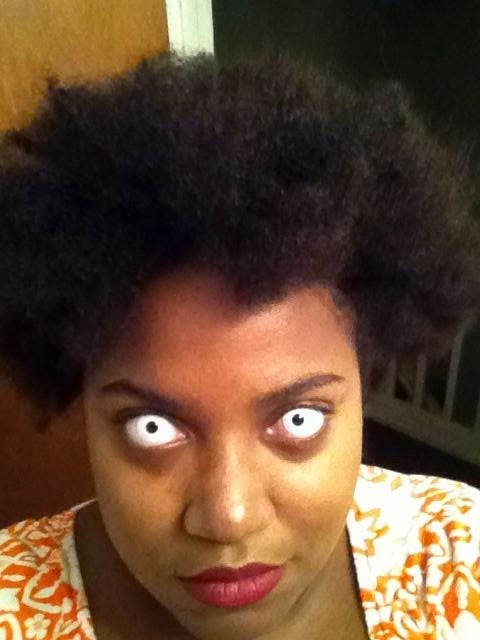 I really want to be scary, I have whiteout and red contacts for two different styles. Since there is a lack of Black women (Black folks in general), doing scary makeup tutorials I want to try and share my experience. I'm also a very shy person, at least private. However, the lack of representation really annoyed me. 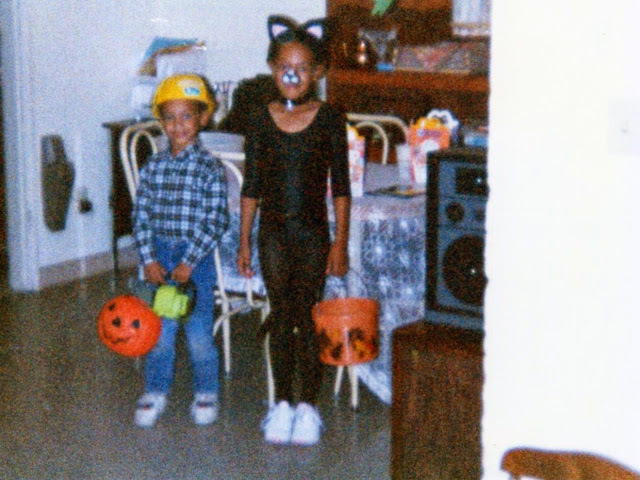 Jamelle (@zhombiehunter) at 7 or 8 with her brother.